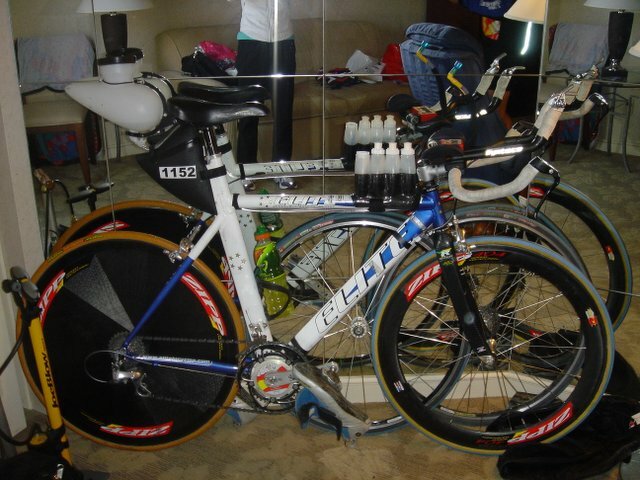 Ironman Coeur d’ Alene 2005 Race report. of my training buddy Greg B who couldn’t do the race this year. The 4800 meter swim was the easiest Ironman swim I’ve ever done. They changed the swim course this year by expanding the beach start so we could spread out more. The old narrow beach start crammed 1761 swimmers into a very small space that resulted in an unavoidable pummelling session for the first 15 minutes of the swim. The new start meant that we could spread out more and I took full advantage of that by starting at the far right (counter clockwise swim direction). This probably added a 100 meters or so to my swim, but it was the first IM swim where I didn’t even touch another swimmer once. My swim was over in 1:12 for a 50 percent finish – right in the middle of my age group (266 men 40-44 years). My 100 meter pace worked out to be 1:55/100 meters which is disappointing because I can hold 1:45/100 in the pool for 3000 meters. After a 4 minute transition I was on the bike. I really am not a big fan of this bike route – it’s very twisty and stop and go and hilly. You can’t get into a steady aero pace for long before you are sitting up and breaking for a turn, narrow bridge, small hill or what ever. 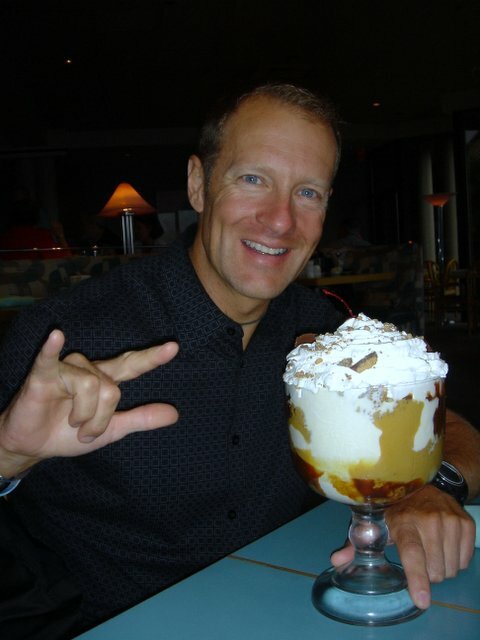 This is probably why I do so much better at Ironman Canada. I maintained a focus of about 220 watts for the first loop of the 2 loop, 112 mile course which resulted in an actual average (includes coasting zeros) of 201 watts. 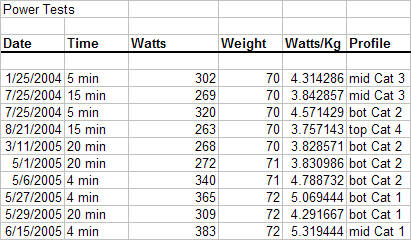 After looking at my watts average during the first loop, I knew goal #1 (to qualify) was shot. On my second loop, my legs were becoming very fatigued and I was only able to manage an average of 182 watts for an overall average of 194 watts and 33.24 kph which resulted in a time of 5:25 (same as last year). This was very disappointing to me. At the end of last summer, I did the Ironman Canada bike course in 5:11 and averaged 203 watts. All I could hope for at this point was a decent run and satisfying goal #2 – new PR. So the big question is – why hasn’t my increase in power over the last year translated into a better Ironman bike time????? One of my previous Ironman limiters has been stomach cramps (side stitch) on the first hour of the run, right after the bike. A few months ago I did a sweat rate test and determined that I sweat way more than average – about 1.98 liters of water per hour! So, my plan was an aggressive hydration attempt during the bike leg with plenty of additional sodium. I tried to average 1.5 water bottles plus 1.4 grams of sodium per aid station (10 stations). I ended up taking in 11 nuun tablets and I’m not sure how much water I drank, but it was making me gag. 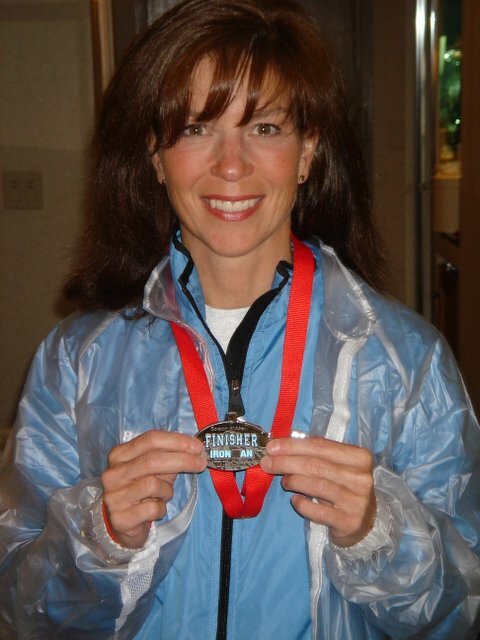 This paid off – my stomach was great on the run – no cramps, no sickness, no stitches. But my legs were really fatigued and my feet hurt like hell. This made for a very slow start, but I continued to speed up my pace throughout the marathon and finished very strong in 4:08. If I maintained my last 10 km pace right from the start, I would have easily finished in 3:45. Oh well… Maybe next time. Helen also set a new PR of 13:42 and sliced a good 30 minutes off her time from last year. 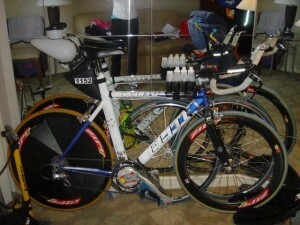 The speed machine ready for an assault on IMcda! I actually think it’s getting a bit gadgety looking – too many bells and whistles. I need to spend some time and clean up the aero profile a bit. I would also love to shave off a few pounds! 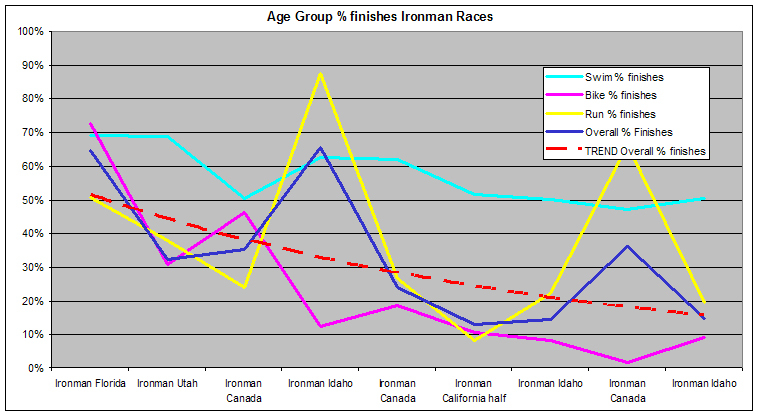 Here is a graph of my previous Ironman finishes as percent finish in my age group. 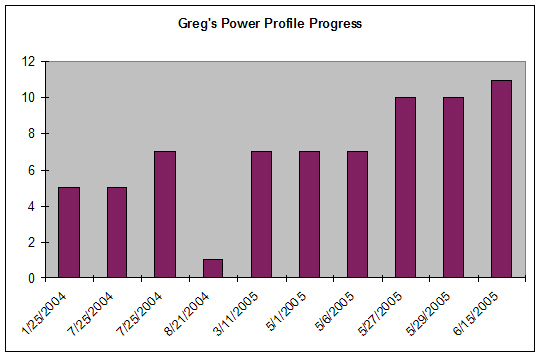 You can see the red trend line starting to flatten out – unfortunately, in order for me to qualify for the world championships in Kona Hawaii, I need to finish in the top 5% of my age group. If this plot is at all predictive, It clearly shows that I would never actually reach the 5% level (due mostly to the run and swim). All in all, it was a fantastic day as Ironman always is. I would say one of the highlights of this years event was the C-different group participation. C-different is an organization that pairs a blind person with a seeing person to enable the visually impaired to live an active and normal life. Can you imagine swimming 2.4 miles in an open lake with 1700 other swimmers when you can’t see? And your only guide is a tether to your seeing partner. Amazing. It brought tears to my eyes every time I saw them. If this isn’t inspirational, I don’t know what is…..